Christmas is almost here. Whether you’re too busy to cook because of all that holiday shopping, or you just don’t want to deal with the mess — there’s tons of great spots open on Christmas day for all of your festive feasting. From buffet style dinners to warm comforting family meals, and more. While most hotel restaurants are open, like Scarpetta, Hakkasan, StripSteak at The Fontainebleau, here are a few spots we recommend making a reservation at on this special holiday. 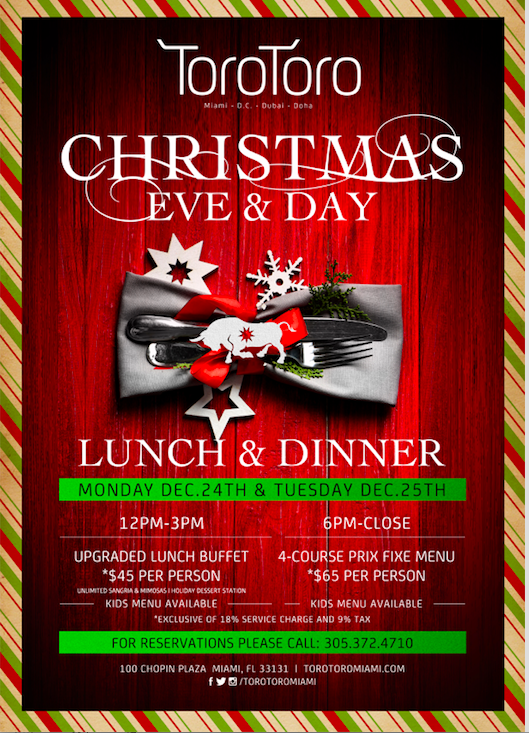 Jingle all the way to Nautilus South Beach as they serve a $75pp Christmas Eve and Christmas Day buffet. The sprawling options includes a salad station with Seafood Ceviche, Chicken and Duck Liver mouse jars with port jelly and brandy, Tomato and Mozzarella, Kale Salad, Roasted beets Salad, Orzo & Sundried Tomatoes Salad and Lentils Soup; a bread station with Pita Bread and Artisan Breads, Humus Dip, Eggplant Dip, Tzatziki, Pickles Vegetables and Roasted Sweet Peppers; Cold Cuts and Artisan Cheese station; a Seafood Raw Bar station; an Assortments Sushi Boat; a Carving Station with Roasted Whole Pig and onion mojo, Atlantic Salmon with brown butter sauce, and Prosciutto, Parmesan & Foie Gras Beef Wellingtons; a Kids Station; and a Desserts station with dishes like Sticky Toffee Pudding Cake, Dark Chocolate Walnut Caramel Pie, Cranberry & Blueberry Tart, Tres Leches, Tiramisu, Assorted Mini Fruit Tarts and Keto Cheesecake. Chef Richard Hales at team at Bird & Bone are serving up a Christmas Day brunch from 10am-3pm and a special prix-fixe dinner menu. Enjoy holiday-inspired dishes with a Southern twist including Key West Shrimp, Aged Beef Prime Rib and Roasted Chestnut Trifle. Make your reservation now by calling 305-424-1234. Area 31 is located on the sixteenth floor of Kimpton EPIC Hotel, 270 Biscayne Blvd. Way in Downtown Miami. For reservations, call 305.424.5234. Christmas Prix-Fixe Dinner Special - $48 per person. $68 additional wine pairings. Indulge in a special three-course pre-fixe dinner for $48 per person. Begin dinner with a creamy polenta and wild mushroom ragout. Entrée choices include a rolled rib-eye roast, stuffed with herbs and served with creamed spinach gratin and crisp potato wedges or a light and flavorful oven-roasted branzino stuffed with grilled fennel, lemon, and herbs served on a bed of sautéed Swiss chard and balsamic roasted carrots. For dessert, select a piece of one of Icebox’s famous cake or pies. Wine pairings are available for an additional $68. This Christmas Eve, if you forget Santa’s cookies and milk, Minnow Bar has got you covered. 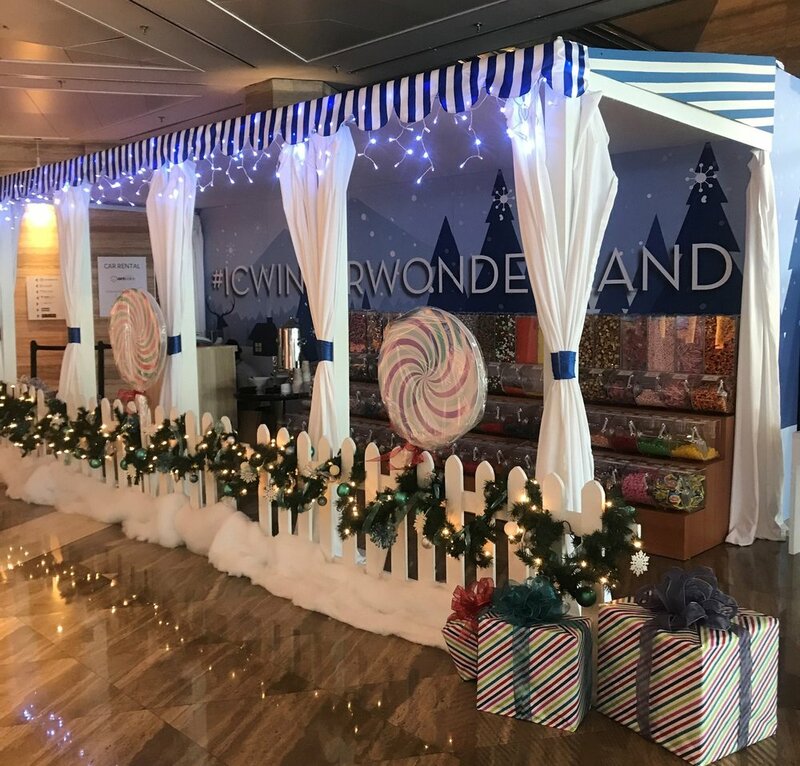 The newest Washington Avenue clear spirits bar will make sure that you don’t get a lump of coal on Christmas by offering freshly baked cookies and milk on Monday, December 24th, along with a big serving of Christmas movie classics. The gin joint will offer its regular refreshing menu, expertly crafted by lead bartender Chris Resnick. Minnow Bar can’t guarantee that the fat man who gets to enjoy the cookies and milk this Christmas Eve will in fact be Santa himself but will make sure to continue The Christmas movie marathon on Christmas Day. Minnow Bar is located adjacent to Kimpton Angler’s Miami at 660 Washington Avenue in Miami Beach. For more information, call 305-534-9600. For those in search of a family-friendly dining experience, Ariete will be serving a family style meal on Christmas Day featuring Chef Michael Beltran’s inventive American cuisine with Cuban influences. From 6PM to 11PM, diners can indulge in a specially curated menu priced at $60 per person, excluding tax and gratuity. The a la carte menu will be available as well as vegetarian options. For those looking to host, The Cave is available for private parties of up to 50 guests with the option of a customized menu. Celebrate the holidays in traditional Italian style this year with a ‘Feast of Seven Fishes’ at Fiola Miami. Savor a four-course dinner, plus dessert for $150 per person, and make it a family affair with a children’s menu for $50. Main courses include, Venetian Calamari Salad with Calvisius Caviar; Baked Maine Scallops with Winter Black Truffle; and Potato Gnocchi with Alaskan King Crab and Tairagai Clams. Available Thursday, December 20 through Monday, December 24th. Fiola Miami will be closed on Christmas Day.